Springfield, Ill.—Springfield Dominican Sister M. Dorothea Sondgeroth, OP, has been named a 2017 recipient of the Catholic Health Association’s Lifetime Achievement Award for her ministry at St. Dominic Health Services, Jackson, Miss. The award is given to a leader in health ministry who has inspired and mentored many others and whose leadership extends past the Catholic health ministry to influence and impact the local community and beyond. 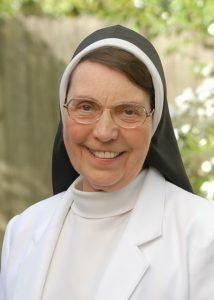 “Sister Dorothea has served the people of Mississippi with wisdom and compassion for nearly four decades; I’m happy for her, for the employees of St. Dominic Health Services, and for the countless people they serve through the healing mission of Jesus,” said Sister Rebecca Ann Gemma, OP, prioress general of the Dominican Sisters of Springfield. St. Dominic’s is a sponsored ministry of the Springfield Dominicans and the only Catholic health care system in Mississippi. Claude W. Harbarger, President of St. Dominic Health Services, said “Sister Dorothea has dedicated her life to service and we, in Jackson, have benefited from our association with her. “Sister Dorothea is the embodiment of kindness and compassion and a wonderful selection for this honor.” Harbarger succeeded Sister M. Dorothea as president of St. Dominic in 2011. After 36 years of overall service and 17 years serving as president of St. Dominic Health Services, Sister M. Dorothea retired from her position in 2011 and has since worked as the associate executive director of the St. Dominic Health Services Foundation. At the start of Sister M. Dorothea’s tenure in 1995, the system held two subsidiaries: the hospital and an organization for community-based services. When she retired from that position 17 years later, the role had grown to include oversight of seven subsidiary organizations comprising a 571-bed hospital with more than 500 affiliated physicians, a large continuing care retirement community (St. Catherine’s Village), and oversight of over 3,000 employees. Sister M. Dorothea, a Mendota, Illinois, native, was also recently featured in A Sister’s Love, a book that chronicles the lives of the Springfield Dominican Sisters who minister at St. Dominic’s. In April of 2012, Bishop Joseph Latino awarded Sister M. Dorothea the Pro Ecclesia et Pontifice Cross, the highest medal Pope Benedict XVI bestowed on non-clergy. The Pope confers this recognition to those who have given distinguished service to the Catholic Church and their communities. Sister Jomary Trstensky, OSF, A Hospital Sister of St. Francis and Chairperson of Hospital Sisters Ministries, Springfield, is also honored with the award. The two Springfield-based Catholic Sisters will receive the award during the CHA annual assembly in June.